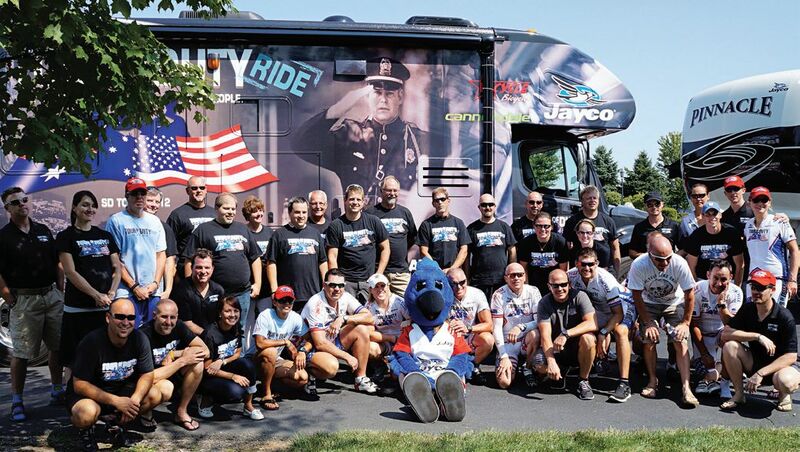 Two Jayco motorhomes served as support vehicles for the “Tour of Duty” bicycle journey after the Middlebury, Ind.-based company donated the use of the RVs. Jayco donated a Seneca 36 FK and Greyhawk 31SS for Tour of Duty, an excursion across the United States that started at the USS Midway in San Diego, Calif. on Aug. 12 and finished in New York City on Sept. 10. The group of 24 Australian and American military members, firefighters and police officers stopped in various cities across the United States to show honor and display appreciation for both nation’s first responders. “We are proud to get behind such a great cause,” said Derald Bontrager, president of Jayco. “Those who serve our country continuously carry out selfless acts of courage and deserve the respect and admiration that this ride represents.” Though the Australian team has been organizing road running events since 1983, the first joint venture with the U.S. was held in 2010 and honored the people of 9/11. During the inaugural Tour of Duty, Australian and American firefighters, police officers and emergency service workers united for a relay run from Los Angeles to New York City. Jayco also donated the use of two motorhomes as support vehicles for that event.